Recently, we did a little survey to see what type of doughnuts you preferred: cake, yeast, or "other"--cream filled or special versions, like a cruller or fritter. Turns out that while there's a lot of love for all types of fried dough out there, moreover Cakespy readers vote, resoundingly, for the cake doughnut (of course, is that a big surprise here?). 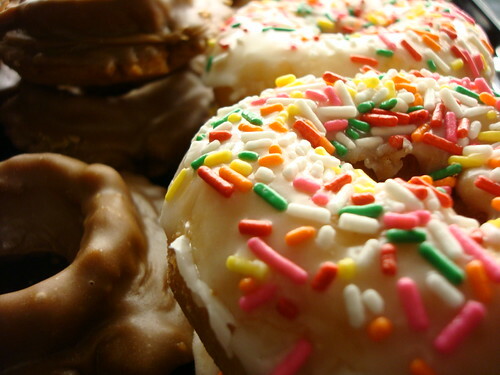 But of course, this still left a nagging question that just wouldn't leave our heads: which is it, doughnut or donut? 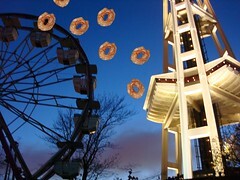 Let us first premise the ensuing argument by saying that no matter what they're called, we love rounds of fried dough. So while it doesn't necessarily matter to us which name is used--doughnut or donut--we were curious to know if one was more "correct". On the one hand, doughnut seems more honest and working-class; donut has the distinct feel of, say, kitchen products that employ the use of "brite" instead of "bright", or something of the like. But really, what impresses us most of all is how both terms are still commonly used. Is it just a matter of time before one spelling reigns supreme? This may be--but in reading the below, at least you'll be educated on that day of reckoning. 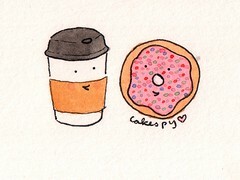 It's true--doughnut was the first term to be used. The earliest known recorded usage of the term dates an 1808 short story which describes a spread of "fire-cakes and dough-nuts." However, its more famous debut is cited as Washington Irving's 1809 History of New York, in which he describes "balls of sweetened dough, fried in hog's fat, and called doughnuts, or olykoeks." Interestingly enough, these little balls he describes probably more closely resemble today's doughnut holes (or Munchkins)--so the term likely refers to the fried dough looking like a nut once finished. Cakespy Note: Of course, there's also a little historical vignette in John T. Edge's wonderful book Donuts: An American Passion (see more info on the book at the end of the post) about the name coming from a crazy lady who sold fried dough (a dough-nutjob, as it were) which we rather like too. The first known printed use of donut was in a 1929 Los Angeles Times article, wherein a writer bemoans the decline of spelling, and that he "can't swallow the 'wel-dun donut' nor the ever so 'gud bred'." The interchangeability of the two spellings becomes evident in several "National Donut Week" articles in The New York Times during the 1939 World's Fair; out of four articles during this time, two articles use the "donut" spelling. 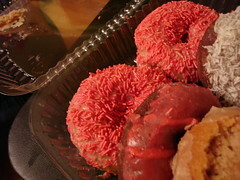 Dunkin' Donuts, which was founded in 1948 under the name Open Kettle (Quincy, Massachusetts), is the oldest surviving company to use the donut variation, but the now closed Mayflower Donut Corporation seems to have been the first to have used the spelling in their company name, having done so prior to World War II. The Intellect: Kenneth G. Wilson, in The Columbia Guide to Standard American English, says: "Doughnut is the conventional spelling, donut a variant used in advertising or signs and as eye dialect." The Electronic Intellect: Spell check says "donuts" is correct; then again, it also says "doughnuts" should be dough-nuts. Source: Cakespy mini sleuthing. Random Dude on the street: "Donuts" sounds lighter and less greasy to me. 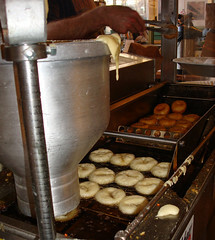 In Laura Ingalls Wilder's book Farmer Boy , Almanzo's mother makes doughnuts, both braided and ring-shaped, and the round ones are referred to as "new-fangled". Price: Interestingly enough, there does seem to be a connection between the price of the fried dough ring and what it's called. Not in all cases of course (Krispy Kreme, which purveys doughnuts, comes to mind as an exception), but enough times that we kind of noticed it. Supermarket Bakeries: In a tour of five Seattle area grocery stores and their bakery sections, four referred to their fried dough treats as Donuts. Of course, we would be remiss if we did not mention that two of our favorite aficionados on the subject both choose to just donut. 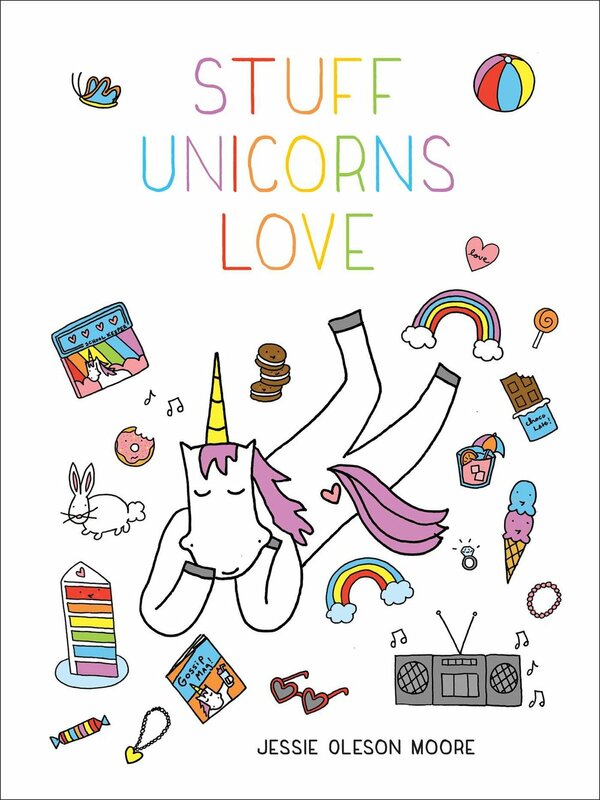 In his wonderful book Donuts: An American Passion (oh, please buy it now! 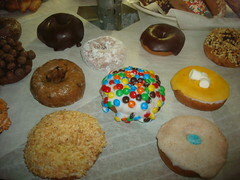 ), John T. Edge notes in a sidebar that he chooses Donut; also, our favorite website dedicated to all things fried dough and holey (well, mostly, though they feature cream-filled and hole-devoid versions too), theblognut.net, refers to 'em as donuts. Considering their expertise, this is a strong argument indeed! So, all things considered, is either doughnut or donut correct? Though some can get quite passionate about the subject, ultimately we elect that no, it's not a matter of being right or wrong; dollars to do(ugh)nuts, taste wins every time. Oh yes, we really just said that.